This is refreshing! 50 somethings can be cool too! Currently reading Bowie in Berlin & Confederacy of Dunces. I am due to turn 50 in 2 years so am in preparation. Just been bought Vidal Sassoon’s autobiography as a birthday gift and can highly recommend “Just Kids” by Patti Smith, who herself is an excellent role model for life. Love your photos of St Ives. I have been visiting for over 20 years and never fall out of love with the place, the people, the smells and the sounds. Everything by Nancy Mitford, Barbara Pym, Elizabeth Taylor (not the actress!). Yes, fifty and looking to do it in style! Love YouTube video of Anna Dello Russo dancing and cool at 50! http://www.youtube.com/watch?v=wbEnW_iUHLM&feature=share. Reading The Human Stain by Philip Roth and learning portrait photography! Love your sytle! 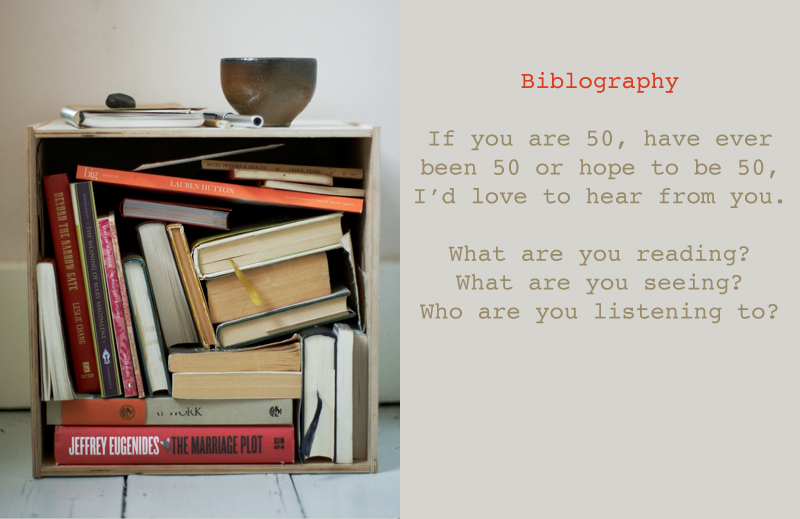 I am turning 48 in August, it’s exciting to almost be 50 Two books that I just read that are influencing my thoughts and actions are ‘Imagine’ How Creativity Works by Jonah Lehrer and Thinking Fast and Slow by Daniel Kahneman. I found your beautiful work via ‘a few things from my life’ – I’m inspired. It was liberating to cross the divide!!! I feel more confident, in control and free to be me than ever before. As for the reading list, the Bhagavad Gita and Tso Te Ching are certainly worthy additions. i am almost pushing 50 (46) and although many many books have been read by this midlifer, she has not read the right stuff for the most part. i.e. i can’t stick with fiction easily. soooooooo, my picks for you to read: anything by Anne Lamott and David Sedaris. they are my favorites because they are hilarious, one-off, and admittedly messed up but fabulous. check out SQUIRREL MEETS CHIPMUNK and see what you think. p.s. i am a great admirer of your work–just came from your site and portfolio. i am a chicago girl too (living in northern illinois now), so maybe that’s why so much resonates! Thanks Michele. Anne Lamott is a favorite. Travelling Mercies I read just a few years ago and felt it was like spending time with a (very funny) wise friend. Five months from turning 80 I remember 50 and 60 and 70 as ages full of living. Read Antigone and all of E. F. Benson’s Mapp and Lucia stories – find a poet who turns you to jelly – and decide to Master something – 2 hours a day for 50 weeks a year and in 14 years you’ve achieved the 10,000 hours recommended to be a success at a new skill – Even starting at at age 59 you are still only a 73 year old success – then start again at 73 adding another skill and you will have mastered two skills by the time you are 87 – a worthwhile life that takes care of any sneaky old age depression. Oh yes, do not let yourself go regardless lower energy or illness. A beautiful friend of mine told me about your blog on my 48th birthday…I love the message, the images, the adventure…thank you for sharing. I am a jewelry designer living in California…I am crazy about being true to who you are and spreading the message to love who you are. Style is a way to express who you are on the inside, without rules or restrictions. I am so happy to have found your beautiful blog and look forward to reading it from now on. I am 55 this year and am so glad I have found your lovely blog. Totally inspired by the ideas and ‘take’ on life in your 50s. After many years working in completely the wrong jobs I went to university in my 40s, gained a First in Creative Arts, then went on to complete a Masters in Textile Design. So much happier living a creative life! Style is definitely about attitude at any age – not getting stuck in a rut and keeping an open mind. I remember people who were ‘stuck’ in their 20s! I bought a horse when I turned 50. When I ride my little black mare I am 14 and summers are endless, I am a pioneer woman crossing a snowy plain, I am a cow hand on the range, I am fast, I am a little frightened, I am in a bit of pain, I sing songs out loud to calm both our nerves, I am alert to the fox in the underbrush and the wind in the tree tops. I want to burn the feeling into my brain so I will remember it always. I am reading Tale of Genji (I swear I will finish it this time). On my bedside table is John Donne and Derek Mahon and Elizabeth Bishop. Wonderful blog — I so needed this. Keep it up! I love your blog and I can hardly wait to read more and see more photos of women in our age group. I am fifty one in 4 days. Last year when I turned 50 I was in the midst of chemotherapy for breast cancer so I kind of intellectually missed the big milestone that is turning 50! Back to life now I to search and look for peer role models constantly. They are really tough to find! I relate to a woman who is yes, comfortable in her own skin yet is still curious about life and herself. And, I also identify with the woman who still wants to present herself in a way that feels genuine not like she is reaching back. But what does this look like?! I am so glad you are doing this blog. Keep going!!! Thanks for the encouragement and hey do we share the same birthday? I turn 51 on March 23. This blog was my hope and promise to myself at 50. I love what you said about being genuine and not reaching back. It’s not about trying to be something you were at 30 or 40 its about being 50 and searching for what is unique about this particular age. Thank you for setting up this project and blog, a friend send me the link. I’ve thoroughly enjoyed reading and seeing the photo’s of these amazing and gorgeous women so far. (Grinning, though it made me feel a bit grey in comparison to be honest. )Lots of music and books to look up now. Also loved the comments. As I am born in ’61 I am now 52. Married 32 years ago to a man who still gives me goosebumps. We have 6 children, social amazing beings. and 2 small grandchildren. I work as a visual artist. Love the beach, traveling, running barefoot, baking our own bread as we’ve always done, seeing my love. Again I now read D. H. Lawrence and a book about an ultra runner. Music shifts these days from Black keys in the studio to Mogwai at home. So far, some of it I do not find easy, this changing body (again..) and that feeling in my chest when I see the empty rooms now all our kids left home, this different stage. Grinning, but there is also this weird feeling of being older and still 18 at the same time, and feeling happy and loving my grown up family. I can still jump in puddles, laugh, shamelessly sob, again lay down and look at the sky or turn around and look at the leaves, taste salty seawater, have time to learn new ways, spend time, sit, breathe. Wish you well with your work Kristin! Anything by Laurie Colwin, Anne Lamott, Stacy Schiff. Love Gary Schteyngart and Jeffrey Eugenides, too! I found your blog several months ago, and was an immediate fan. Recently reread every post as I approach my 50th birthday in May. Struggling with how it’s possible that I have 50 years in my wake. 50 is certainly different than I thought it would be. I still feel vital and young, yet the mirror often tells a different story. Your images of these beautiful women inspire me as I navigate this milestone. THANK YOU. Hello Kristin I was introduced to your beautiful inspiring blog just today and am smitten. I read pictures and listen. Have Wool gathering by Patti Smith open right now. Completed when she was 45. I love seeing young women doing amazing things. I don’t envy their youth but am excited for them as they have it all before them. I am 52 years young and thought I had it all sorted then life throws up more surprises and I find myself facing a year of change. Both scary and exciting! Read every page of your blog last night and loved it. I have just turned 60 (How’s that happen?) and you and all those wonderful women made me feel so much better about myself. Neither grace nor style have ever been my strong points, but I’ve at least lived those truths with grace. I’m 54, a designer, artist, writer and mom of a teen boy. I’m super excited about the social revolutions happening right now, under our very noses, documented or not. So, so good to read these beautiful and wise thoughts here written. I once heard someone say that when you turn fifty you have clout; these stories are truly proof that Women over fifty are on the threshold of the fullness of their lives. I am reading “The Mountain of Silence” by Kyriacos C. Markides, “The Shepherds Life” by James Rebanks, and a book of poetry, “Redbird” by Mary Oliver. I am listening to my Husband, my Daughter, My sisters, my neighbors, and to the places where I live. Reading “This is 50′” totally captures my imagination, Thank You for creating this beautiful space.